Holiday Gift Guide 2017+WooHoo! Gifts! The Six Flags Great Escape Lodge is pumped to announce the addition of an all-new family inspired event, Spring Break Escape 2016! Buckle up for the North Country’s first Caribbean inspired beach party designed specifically with the littlest spring breakers in mind. Every weekend in April, the beautiful Adirondack lobby will transport parents and children to a land of luaus and limbo with exciting events, dance parties, signature cocktails (kid friendly of course) and photo booths to capture the best of your spring break getaway. During Upstate New York’s School Break Period, April 23-30, Spring Break events and activities will be held daily including scavenger hunts, picnics, dance competitions and nightly interactive parties. The vacation week’s grand finale will be headlined by live music on Friday and Saturday night. Join us for an amazing time! 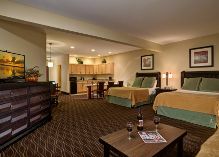 Ready for a fun-filled stay in the Lake George area you’ll never forget? 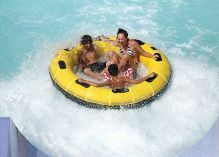 The Six Flags Great Escape Lodge & Indoor Water Park is a 200-room family suite lodge with Lake George resorts style, featuring an incredible 38,000 sq ft indoor water park with attractions designed to make every age group smile. 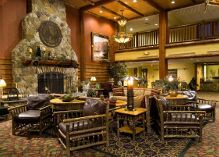 From the moment you walk in to the rustically elegant Adirondack-inspired lobby, to the moment you reluctantly check-out, you will appreciate all the great amenities this four-story kid-friendly resort in the Adirondacks provides. Plan an Adirondack fall getaway the whole family will love! Along with easy access to the nearby Great Escape, you’ll love the roomy suites designed to comfortably accommodate groups from four to twelve. We know you’ll love our location near Lake George NY, hotel suite luxury with Adirondack Lodge ambiance, and all the activities we have to offer. Plan your next meeting, group event, birthday party or wedding with us! We look forward to welcoming you back year after year!